At the end of the previous comment above, I asked how we would go about writing a function to expand the zero point of the unit circle on the complex plane, in all directions over time, to π, the area of the unit circle, and back to zero. I'm sure someone much smarter than I am has already done this, but, if so, I don't know about it. It seems straightforward enough, but I may be showing my naivete. Recall that the reason we want to do this is that we want to translate the vector motion of the LST, as used in the model of the atom, to the scalar motion of the LRC's RST-based model of the atom, which has no vector motion, but consists of strictly scalar motion. We want to use the "complex exponential," eπi = -1, because it consists of the sum of the cosine and i times the sine, of the angle θ. This is very useful for reconstructing a sine or cosine wave over time, but it's also applicable to the scalar motion expansion/contraction of the RSt's S|T unit, since the sine and cosine of angle θ are orthogonal and thus reciprocal magnitudes, as are the S and T oscillations of the S|T unit. However, the ratio between the angles of the right triangle, upon which the sine and cosine are based, produce four changes of sign (polarity) as the angle θ grows from 0 to 90, 90 to 180, 180 to 270 and 270 to 360 degrees, each of which are associated with the four quadrantal rotations (4 x π/2). What we want are two changes of sign (a change equivalent to a rotation from 0 to 180, and from 180 to 360), as the sphere expands and contracts, over π, in each "direction." This requires us to view the complex exponential, eiωt, from a new perspective. Instead of viewing it as the 2π rotation cycle in the positive direction, and its negative form, e-iωt, as the 2π rotation cycle in the negative direction, where their sum is divided by 2, i.e. ((eiωt) + (e-iωt))/2, to extract cos(ωt), we should view the same thing as a 2 x π = 2π expansion/contraction cycle, over two, 2π rotations. Of course, there is an important distinction that remains to be made between scalar motion and vector motion: Scalar motion expands/contracts in all the "directions" of a given dimension simultaneously, while vector motion changes location in one "direction" at a time. In one dimension of scalar motion, an oscillating length for example, there are two "directions" involved (positive and negative). Therefore, the scalar expansion/contraction of the 1D diameter takes place in these two opposite "directions," relative to the point of origin. So, one cycle of 1D oscillation involves expansion/contraction along four lengths of "radii," if you will: one in each of two opposite "directions," when expanding outward, and one in each of two opposite "directions," when contracting inward. In two dimensions of scalar motion, as in the area of the circle, however, there are four "directions" (two positive and two negative). Therefore, the scalar expansion/contraction of the area takes place in these four opposing "directions" (quadrants) relative to the point of origin. The motion takes place in all of them simultaneously. So, one full cycle, involves motion over eight "radii," if you will: over four when expanding outward and back over the same four when contracting inward. The corresponding 1D vector motion, on the other hand, always moves a point along the length of the radius, one "direction" at a time: For example, it extends outward one positive unit, retracts inward one positive unit, extends outward one negative unit and retracts inward one negative unit, every cycle. Moreover, vector motion in more than one dimension at a time is impossible, even though separate motions in more than one dimension, may be combined, as they are in the case of the sine and cosine of eiθ, which is actually the rotation of a complex number of magnitude one. Vector motion along the x axis, composed of 1/2(eiθ) and 1/2(e-iθ), when the angle θ changes over time, as ωt, is shown here, as the vector sum of two opposite vector rotations. This vector sum transits the unit radius, four times per cycle, in and out, in two opposite "directions." I wish I could produce a similar video for the corresponding motion of the changing scalar area, but I'll have to settle for a crude animated gif to show the comparison. First, I have to explain, though, that the reason the correspondence between the 1D vector motion of rotation and the 2D scalar motion of oscillation exists is that the unit of 2π radians of the unit circle is actually a dimensionless number, which can be derived from both a 1D length and a 2D area. The dimension of the arc length of the 2π radians along the circumference, which is used to define the radian, is, of course, the same as the dimension of the 1D radius, while the dimensions of the area sector determined by the 1D arcs are obviously the same as the area of the circle. Thus, at the unit magnitude of r, the disparity in dimensions makes no difference, and the magnitude of the rotation is simply twice that of the expansion/contraction; that is, the rotation cycle is 2π versus the 1π expansion cycle. 2πr/r = 2π and πr2/r2 = π.
Consequently, given that the complex exponential, eπi, is equal to π radians, it is also equal to the number of area units of the expanded circle, but these units have different dimensions. In terms of rotating around the circle, the complex exponential is only half way around it, at π radians. To complete one revolution of the circle, it must rotate another π radians, thus taking two π, 1D radians of rotation, to "paint" one π, 2D radians of area, if you will. In the graphic above, I didn't follow the usual convention used, when plotting the sine/cosine of angle θ, by starting at 90 degrees and increasing counter-clockwise, but instead I started at 0 degrees, proceeding clockwise around the circle, and, as the graphic shows, as the angle increases, the magnitude of the 1D arc of the black circle's circumference that is transited to that point is equal to the entire circumference of the red expanding circle, during the first, 2π, rotation cycle. 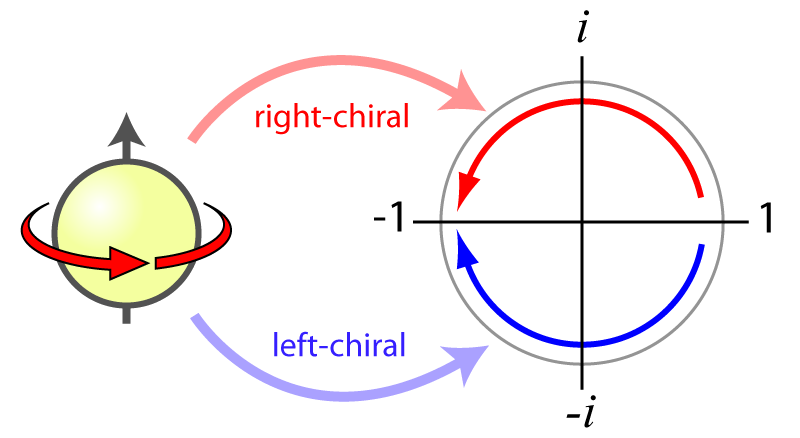 During the second, 2π, rotation cycle, the red circle contracts back to zero, completing one full scalar cycle. However, since there are two, reciprocal oscillations that constitute the S|T unit, one space oscillation and one time oscillation, the associated, inverse rotation of the view of the rotation shown in the graphic above, occurs on the other side of the circle, which if we turned it around, would be rotating in the counter-clockwise "direction." The two, 2π rotation cycles associated with these two scalar expansions are not shown in this graphic, but if we were to show them side by side, one would be rotating around the unit circle in the clockwise "direction" while the other would be rotating in the counter-clockwise "direction." The bottom line is to show that there is a correspondence between the vector motion of the LST's complex exponential, eiωt, with its inverse, e-iωt, and the two, inverse scalar oscillations of the S|T unit. Of course, the oscillations of the S|T unit are three dimensional volume oscillations, but they can be characterized by any of their dimensional components. In this case, the 2D scalar motion is isomorphic to the LST's 2D vector motion known as a "quantity of motion," or more commonly, momentum, even though no mass or vector velocity is involved. This is important for our theoretical development, since in our model of the atom, the space-like (negative) oscillation of the electron combines with the time-like (positive) oscillation of the proton, and there is no separation between the two, such as the all important Bohr radius in the LST model, which gives rise either to an orbiting point charge in the Bohr model, or a set of circulating electric currents in Mills' modification of the Bohr model. With this much understood, we need to show that the 2D scalar motion of our model can be seen as the equivalent to the angular momentum of Mills' model, which will hopefully enable us to construct a scalar motion model of the atom as successful as his is. I'm sure someone much smarter than I am has already done this, but, if so, I don't know about it. It seems straightforward enough, but I may be showing my naivete. Yes, the person is Prof. KVK Nehru and it is called "birotation." There's no doubt Nehru is much smarter than I am, but I don't think his bi-rotation is a scalar motion. A scalar change, by definition, is a change in size, and rotation of a fixed size necessarily has to be a vector motion, it seems to me. It's hard to get away from vector motion, though. Nehru wrote, "While it is clear that a SHM underlies the photon from the phenomena of interference and diffraction, the genesis of SHM, given only uniform speed (as in scalar motion), is not possible except through rotation." I disagree, of course, because, as I have already stated, rotation of a fixed radius cannot be a scalar motion, by definition. As I have shown in previous posts, both space and time displacement from the uniform scalar motion dubbed the progression is possible without rotation. Indeed, Larson believed that the only possibility for deviation from uniform speed was the idea of "direction" reversal. His conclusion was challenged from the outset by many who believed that the introduction of the idea was not justified given no mechanism could be cited as the cause of the reversal, but he insisted that no mechanism is required, just the fact that it is something that is conceivable was enough. "What can exist, does exist," was his answer. Larson couldn't rebut this argument, but insisted that the reversals had to be SHM. The position that the LRC research has taken is that Larson was both right and wrong: He was right about the "direction" reversals, but he was wrong about the dimensions of those reversals. They are not 1D reversals, but 3D reversals. SHM does result from a 3D oscillation, because, the motion of expansion in all directions, from a point, is exponential. Therefore, at the end of one unit of expansion, when the "direction" reversal takes place, the change is not abrupt as in a square wave. In fact, it follows the smooth "direction" change of rotation, as shown in my previous post. At least that is the conclusion upon which the LRC research has been based. If it's incorrect, time will tell. When Randell Mills modified the Bohr atomic model, by modifying the traditional model of the electron, changing it from an orbiting point charge to a sphere of circulating charge currents, creating a shell of electric charge surrounding the proton, the vector motion equation of the new model did not change from that of the old model. The value of +e changed to +e/n, where n is the number of the Bohr orbit, because, in Mills' model, a photon is resonating within the shell, changing the effective charge felt between the proton and the rings of circulating charge currents on the shell's surface. The value of r is changed from Bohr's square of the orbital radius times the electron de Broglie wavelength, a0, to just the orbital radius times a0, because, unlike the orbit, the shell expands to a radius that precisely accommodates one electron de Broglie wavelength. In the Bohr model, the orbit accommodates the number of de Broglie wavelengths that will fit the circumference of the orbit, at a given radius r.
This is a crucial point, and the point where A. Rathke asserts that Mills goes astray, because the wavelength of his solution to the classical wave equation of motion cannot correspond to the classical circumference of Bohr's electron orbit. In other words, the wavelength of Mills' solution to the classical wave equation does not allow a "quantisation condition," where λ = 2πr, instead of Bohr's quantisation condition, where nλ = 2πr, according to Rathke. I cannot follow the arguments either way, but the experimental evidence that I have seen seems to clearly vindicate the work of Mills. If Mills is correct, then combining the de Broglie formula, where the wavelength is equal to h/mv, with the equation Mills derived from the classical wave equation, where the wavelength is equal to h/2πr, we get 2πr = h/mv, instead of 2πr = nh/mv, and this makes all the difference! At n = 1, where the radius of the Bohr orbit is equal to one wavelength, a0, the wavelength outputs of the two equations are the same, but when n is greater than, or less than, one, the wavelength outputs of the two models are different, unless they are calculated in terms of kinetic and potential energy exchanges, according to angular momentum equal to h/2π, or h bar. In this case, using the angular momentum, instead of the number of electron wavelengths, in the classical equation, the total energy is always the same in both models, for all values of n ≥ 1, because, the calculation of the total energy of the orbiting electron and the orbitsphere, from the sum of the kinetic and potential energy calculations of both, are equal, as shown by Driscoll. Moreover, given the two changes (in +e and r), the n2 term in Bohr's model makes magnitudes of n < 1 impossible, so only in Mills' model is it theoretically possible to produce hydrinos, or hydrogen atoms at lower than the unit ground state. As they say, however, "out of small things, proceedeth that which is great!" The discovery of hydrino energy, resulting from this new theory of the atom, could potentially turn the industrial world upside down. But this is not all: Mills' theory destroys the LST's theory of quantum mechanics, because it explains the dual nature of matter, which QM has struggled with for almost a century, in terms of a transformation of the electron from a sphere of charge, surrounding the proton, to a propagating planar wave, at ionization. So, instead of matter being regarded as composed of particles that are also waves, with all the paradox associated with that assertion, the new theory regards it as composed of particles that become waves, and waves that become particles, removing the paradox. Yet, what is iconoclastic for the LST's QM theory is great news for the ongoing development of the RST-based theory, because in our system all physical phenomena, including matter, are either motions, combinations of motions, or relations between them. For the LST community, Mills' theory represents a quantum advancement (even though they don't recognize it yet). Nevertheless, it is still one that is based on vector motion, while the RST community knows the trouble in theoretical physics, to which that approach must inevitably lead. In our attempt to develop an RST-based theory at the LRC, the scalar motions that constitute all the fermions and bosons of the physical universe, including the electrons and protons and photons, etc, with which we are dealing here, are considered as oscillating space and time volumes, as we have been showing. Hence, we have to somehow equate the angular momentum of the Bohr model's orbiting point masses and the angular momentum of the Mills' model of circulating charge currents, both of which are a concept construed from the 1D tangential velocity of mass, to a concept of a 2D radial change of space and time, or the motion of 2D oscillations, the 1D aspects of which are net space oscillations (negative "charges") or net time oscillations (positive "charges"). In the previous post, we were able to relate the mathematics of the 1D vector motion of oscillation to the 2D scalar motion of oscillation, which ought to enable us to relate the physics of the angular momentum of vector rotations (mvr) to the physics of the "momentum" of scalar oscillations (2πr is the derivative of πr2), even though there is no oscillating mass in the scalar model. The implication is that the measurable properties of these scalar motion combinations stem from their intrinsic multi-dimensional character. In other words, the "mass" of these combinations of scalar oscillations is simply the magnitude of resistance to their net 3D scalar motion (s3/t3), while their "momentum" is the magnitude of resistance to their net 2D scalar motion (s2/t2), and their "charge" is merely the magnitude of resistance to their net 1D scalar motion (s1/t1). (10/13) + (6/3) = 16/16 = 1/1, or net zero "charge" (0 time/space displacement). In the vector model, this net zero "charge" is represented as a balance of forces, between the outward force of the angular momentum, L, of the electron and the inward force of attraction between the opposite charges. As the energy of the orbiting electron increments one level, the magnitude of the orbital radius increases by the square, to maintain the balance, while the spherical radius increases by one, to maintain it. Since the Bohr radius at n = 1, is a0, our task is to find the equivalent "mass," "angular momentum," and "charge" in our scalar model at that radius, assuming that the radius of the scalar oscillations, n, increases by one, as in Mills' model, not by the square, as in Bohr's model. Of course, it appears that the two concepts are disparate and not directly comparable, because the radius of the oscillation is constantly changing, from 0 to n, in the scalar model, unlike in the vector model, where the radius is constant for a given n level. However, since there are two, reciprocal, oscillations in the S|T units, which are inversely proportional, the combined motion of the outward radial velocity, vO, and the inward radial velocity, vI, is entirely analogous to the simple harmonic motion (SHM) of a swinging pendulum, or oscillating mass on a spring, in which the total energy of the motion remains constant, through a continual exchange of its kinetic and potential energy. In the S|T oscillation, the net magnitude of the radii and thus the net magnitude of the 2D area (2D space/2D time) between them remains constant over the time (space) oscillation. That is to say, as the radius of the space oscillation increases from 0 to a0, the radius of the time oscillation decreases from a0 to 0, and vice-versa, so that, in effect, the SHM of the scalar motion oscillation, vs, is analogous to the SHM of the oscillating mass on a spring. "where ρ(t, x) is the time dependent charge density function of the electron in time and space, and v is the velocity of the charge-density wave." What is crucial for the RST community to understand, however, is that the fundamental postulate of the system, that all properties of matter are only manifestations of scalar motion, changes everything. Mass and all its derivatives in the energy group have no role in the science of the scalar motion of the material system. They are only useful, as Newton and others of the LST discovered, in the world of vector motion, where the relations of interacting particles, in different inertial reference systems, must be taken into account, according to the rules of that science. In the theoretical world of the RST, the rules and laws of vector motion only apply when observations of physical phenomena require a knowledge of them to confirm theoretical conclusions, but RST science is not bound by them per se. This is what makes the challenge of building the science so terrific. How do we dispense with the concepts of mass and momentum and energy, as developed so successfully in LST theories, and replace them with concepts of 3D, 2D and 1D scalar motion in RST theories? We will explore one possible approach next time. ....we need to formulate the scalar change of space over the scalar change of time, in quantitative terms. Before you do that, you need to qualitatively formulate the scalar change of space over the scalar change of time. Such as that contracting space over expanding time is equivalent to expanding space over contracting time. If you don't get that, you'll be lost forever. However, the earlier graphic is incorrect, as a 180 degree rotation should place the cosmic sector (CS) time progression opposite the material sector (MS) space progression, and the CS space progression opposite the MS time progression. The graphic above is the corrected version. In this way, the upward vertical time progression in the material sector is rotated to the horizontal leftward progression of space, outward from the origin in the left hand "direction," opposite the outward right hand "direction" of space progression in the material sector. Likewise, the rightward space progression in the material sector is rotated to the downward vertical progression of time, outward from the origin in the downward "direction," opposite the upward "direction" of time progression in the material sector. Hence, we see that material time progression is the reciprocal of cosmic space progression and material space progression is the reciprocal of cosmic time progression, just as Larson asserted. The "direction" of expanding space in the MS (progression to the right), is the "direction" of contracting space in the CS (anti-progression to the right), and vice-versa. Expanding time in the MS (progression upward), is the "direction" of contracting time in the CS (anti-progression upward). I trust this is what you were refering to, Horace. Modified Fundamental Postulate of the RST: The physical universe is composed entirely of one component, motion, existing in discrete units, in the eight "directions," of three dimensions, and with two reciprocal aspects, space and time. As it turns out, with this modification, there is no need for any additional postulates regarding mathematics and geometry, because adding the phrase, "in the eight 'directions,' of three dimensions," accomplishes what was covered in the second postulate of Larson's system, as will be shown at some point later on. Although, our immediate objective is to construct a scalar motion model of the Hydrogen atom, which can replace the vector model of Bohr, as modified by Mills, it turns out that we have to understand the nature of the photon first. In the RSt of the LRC, all physical phenomena are either motions, combinations of motions or relations between them, as required by the fundamental postulate of the new system of theory. As I have explained from the beginning of this discussion of our research, this has led, step by step, to the preons called S|T units, the logical (mathematical) combinations of which turn out to follow the observed pattern of the LST's standard model of particle physics, which consists of a well-defined set of bosons and fermions. 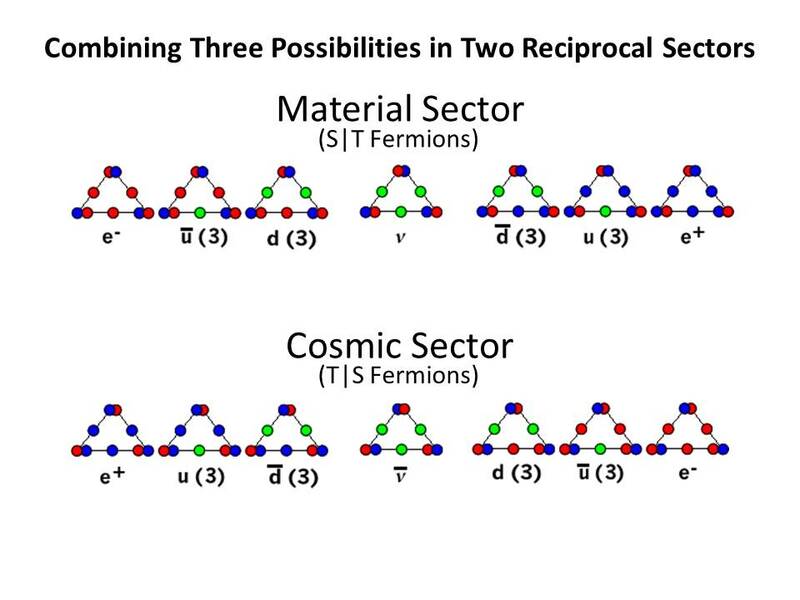 The happy result is that all the elements of the periodic table can be constructed from the fermions of the pattern, but it requires the distinction between fermions and bosons to be based on different configurations of multiple S|T units: The fermions are configured as end-to-end triple combinations, which can be represented schematically as triangles, while the bosons are configured in parallel triple combinations, that are easily stacked together, represented schematically as bundles, and this difference accounts for the distinct properties of the two types of particles. At first it seemed natural to assume that the quantum deltas of energy, giving rise to the observed atomic spectra, were due to the absorption/emission of these bosons into the fermion combo of the Hydrogen atom. This approach seemed to work well with the Rydberg formula, but it was unclear how the bosons were to be handled - were they absorbed/emitted as triple bundles, or as single S|T units? The answer was unclear, and still is, as we seek to find scalar motion equations analogous to those of the LST's vector motion equations, modeling the atom. It's well known that the Hydrogen atom is the building block of all matter. Each atom of the periodic table is an integer multiple of Hydrogen. This means that the number of S|T units in our table of the periodic elements is incremented by the number of S|T units in Hydrogen, or (S|T)n = n x 108|108 (n x Deuterium). When the initial neutrino's count of S|T units is doubled, from S|T = 12|12, to S|T = 24|24, the Helium atom can be derived from the new set of fermions that follows, which now follow the S|T unit's pattern of natural units of motion (num), 24|24, 28|28, 32|32, 36|36, up from the 12|12, 14|14, 16|16, 18|18 pattern of the initial set of triples. The process continues for Lithium, etc, incrementing the respective neutrino triplet, by 12|12, for each successive atomic element's fermions. Since the S|T unit num count of the first possible boson triplet is equal to that of the first possible neutrino's num count, S|T=12|12, it's obvious that the basis of the atomic elements of the periodic table may be effectively formed by the successive absorption of a boson triplet (photon), by the preceding element's neutrino. However, the problem of how to account for the varying frequency of the bosons arises, because if the number of their constituent Ss and Ts are unequal, they cease to propagate at unit speed, as we have shown in the world line chart (see here). Nevertheless, the balanced number of Ss and Ts in a given boson can be achieved in various combinations of S|T units, not just combinations of identical ones. For instance, an S|2T, unbalanced unit can combine with a 2S|T unbalanced unit, to form a 3S|3T balanced unit, which would be identical, for all intents and purposes, to a unit formed from three balanced units, S|T + S|T + S|T = 3S|3T. Yet, there is still another possibility, one that arises from the reciprocity of the system. To explore this possibility, we need to consider the cosmic sector version of the material sector world line chart. We can do this by rotating the unit speed line 180 degrees out of the plane of the diagram and back into it, in such a way as to place it in the quadrant diagonally opposite the material sector world line. In this way, the current world line chart in the upper right quadrant, representing the material sector scalar motion, is transformed into its reciprocal form, the cosmic sector world line chart, in the lower left quadrant, as shown in the previous post here. Notice that this rotation transforms the vertical time expansion of the material world line into the horizontal space expansion of the cosmic (reciprocal) sector, progressing outward from the origin, in the opposite, or reciprocal "direction" of the material space progression. Likewise for the material space progression. It is transformed into the vertical cosmic time progression, by the rotation. Hence, we see that material time progression is the reciprocal of cosmic space progression and material space progression is the reciprocal of cosmic time progression, just as Larson asserted, but now we can see that something unexpected emerges from considering the two world lines together. 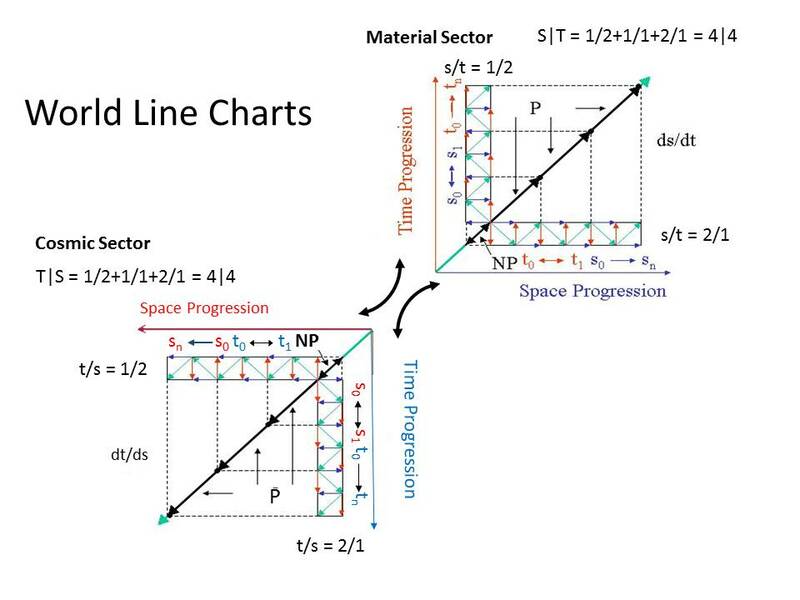 In the graphic above, the three possibilities for S|T units, which we can term as space-like (red), light-like (green) and time-like (blue), as characterized by the slope of the material system (ms) world-line chart, are also characterized for T|S units by the reciprocal world-line chart of the cosmic sector (cs), as shown by swapping the "direction" of the red and blue balance symbols at the center of each S|T unit symbol. On this basis, the S|T balanced fermion, the neutrino, is successively unbalanced by adding more S units (red) than T units (blue) to the left of the neutrino, and it is successively unbalanced in the opposite "direction," by adding more T units than S units to the right of the neutrino. A similar set of combinations is shown for the T|S units, except now additional T units (blue) unbalance the anti-neutrino on the left, while additional S units (red) unbalance it to the right, reflecting the reciprocal symmetry of the cs world-line chart. Here, we see the same reciprocal symmetry in the S|T and T|S units of the boson triplets, as we do in the fermion triplets, but because nothing of the sort has been observed and labeled by the LST community, we have to come up with our own labels for the various combinations, using the Greek mu symbol with an acute accent above (ú0) for the S|T units, and with the grave symbol above (ù0) for the T|S units. The subscript indicates the unit's degree of unbalance and its "direction." From the beginning I recognized the three S|T bosons, ú-3, ú0 and ú3 as possibilities, because they matched the LST W-, Z0, and W+ bosons, and turned out to explain the beta minus and beta plus decay processes really well (see previous comments in introduction thread), even though I disregarded the discussion of the Z0 particle per se, and also how a boson could be "charged." However, it was always apparent that the intermediate combinations were also likely, and if the W- and W+ bosons were charged, so would they be. Yet, since I didn't know what to do with them, I just never bothered to complete the chart shown above. Now, though, we have to deal with the relationship of energy and frequency and absorption/emission of bosons by fermions, at the discrete magnitudes that are observed spectroscopically, if we are going to achieve our objective. The implication is that the fermions of S|T units may combine with fermions of T|S units, as well as with bosons of both kinds, greatly expanding the field of possible scalar motion combinations that need to be handled in our RSt. But that's good news, given that we have yet to account for gravity and the disparate masses of the particles. Hopefully, the answers we need will be found in the as yet unexplored combinations now coming into view. As we all know, the LST community's science of particle physics is based on what they call "high energy physics," where the fermions and bosons of the standard model are studied through the examination of the debris resulting from high energy collisions of the model's particles. The result is that the electron and other particles of atomic physics, such as that of the hydrogen atom, is not described as a simple point-like electric charge, as it is in the Bohr model, but rather it is observed to be a composite particle with properties resulting from the observed chirality of the model's particles. The same chirality emerges from the S|T combos of the fermions and bosons of the LRC's RSt model. It's really important to recognize that this result is not something that was designed into the model, but is an inevitable consequence of the fundamental postulate of the system. In both models each fermion has its reciprocal, or anti-particle, but in two senses. In one sense, an S|T unit's anti-particle, is its reciprocal S|T unit, but in another sense, there is a reciprocal T|S unit for each S|T unit, as well, as can be seen clearly, from the charts shown in the previous post. The first reciprocity stems from the balance of space and time in S|T units of the material sector (ms), and the second reciprocity results from the balance of time and space in T|S units of the cosmic sector (cs), and even though the LST's explanation of this is quite complicated, a child can understand the RST explanation of it: Raising our left arm causes our mirror reflection to raise its right arm and vice-versa. While the left half of our bodies is a reflection of the right half, the right half of our mirror reflection is a reflection of its left half. It's as if the S|T chart of fermions were rotated 180 degrees horizontally, to form the T|S chart of fermions. When the two charts are juxtaposed, each S|T fermion has an T|S equivalent diagonally opposite it in the T|S chart, except neutrinos, which are directly opposite. Hence, the S|T electron on the left (S|T left chirality) is diagonally opposite the T|S electron on the right (T|S right chirality). Likewise, the S|T positron on the right (S|T right chirality) is diagonally opposite the T|S positron on the left (T|S left chirality). In the LST community, which doesn't recognize scalar motion, in space or in time, these distinctions are also understood, but in a much more convoluted and difficult to explain fashion. The electron, anti-electron, anti-positron, and positron. 4. Anti-positron: right-chiral, charge -1, cannot interact with the W.
We’re using names “electron” and “positron” to distinguish between the particles which couple to the W and those that don’t. The conventional language in particle physics is to call these the left-handed (chirality) electron and the right-handed (chirality) electron. But I wanted to use a different notation to emphasize that these are not related to one another by parity (space inversion, or reversing angular momentum). Regardless, however, the important point he makes is the left - and the right + interact with the W- W+ bosons. It's clear that for the S|T (left) electron to be transformed into an S|T neutrino, it has to give up a W- (left) boson, a right one won't do; and for an S|T (right) anti-electron to be transformed into an S|T neutrino, it has to go the other way and give up an S|T W+ (right) boson, a left one simply won't do. The same goes for the T|S positrons, only in this case it's the positron that has to give up a left W+ and the anti-positron that has to give up a right W- boson, to get to the T|S neutrino. Hence, the chiralities must be swapped, according to the appropriate scalar motion sector interaction. All this is straightforward and I agree with Tanedo (if this is what he trying to do) that this change in the nomenclature clears up the confusion between the terms "electron" and "positron." The positron term is more properly applied to the cs version of the electron, since it is the reciprocal sector's corresponding particle. This is especially evident when we understand the reciprocal relations between space and time in the RST equations of motion, so I think I will adopt it. Now, the question is, what is the effect of combining these different particles and what limitations to combining them are imposed by their reciprocal characteristics? We know what happens when the S|T electron and the S|T anti-electron are combined. They are transformed into two photons, and we presume that the same thing should hold for the T|S positron and the T|S anti-positron, but there is a problem, because of our point of view, our frame of reference: In the ms or the cs sector, observers are necessarily on the low side (i.e. the space-like side) of unit speed, which means that the reciprocal sector is on the high side (i.e. the time-like side) of unit speed, and this introduces an inequality in their respective magnitudes. In other words, |1/n| ≠ |n/1|, even though they are equidistant from unit speed, as far as their respective speed-displacements are concerned. This is just another way of saying that, while their absolute values are the same: |-1| = |+1| =1, the magnitude of their respective motions (speeds) is clearly not the same: 4(1/2) = 2/1, so an element of confusion enters the discussion, if this is not well understood. One-half times c is four (22) times slower than two times c, even though both magnitudes are equally displaced from unit speed in terms of their space or time displacement |-1| = |+1|. The world line charts are very helpful to our understanding in this regard, if one has trouble keeping it straight, but, again, the LST community does not recognize the reciprocal nature of space and time and the crucial "swap" of the two in the equation of motion that takes place at the unit boundary. It only recognizes motion in space, not motion in time. What happens when you rotate a left- vs right-chiral fermion 360 degree about its direction of motion. Both particles pick up a -1, but the left-chiral fermion goes one way around the complex plane, while the right-chiral fermion goes the other way. The circle on the right represents the complex phase of the particle’s quantum state; as we rotate a particle, the value of the phase moves along the circle. Rotating the particle 360 degrees only brings you halfway around the circle in a direction that depends on the chirality of the fermion. Rotating a fermion shifts its quantum wavefunction. Left- and right-chiral fermions are shifted in opposite directions. This is a purely quantum phenomenon. But then he quickly dismisses the meaning he has just given us! We don’t have to worry too much about the meaning of this quantum mechanical phase shift. The point is that chirality is related in a “deep” way to the particle’s inherent quantum properties. We’ll see below that this notion of chirality has more dramatic effects when we introduce mass. Yet, even this much can be misleading, because he characterizes the effect of chirality in terms of its interaction with quantum spin, as if the "direction" of quantum spin is a consequence of applying a non-physical spin to a particle, instead of characterizing it as an intrinsic property of the particle itself. Nevertheless, chirality, however inexplicable it is to the LST community, is seen by them to be connected to mass somehow, and that is the important aspect of all this, he asserts. Well, if chirality is connected to mass, and mass is the core concept of LST physics, which we need to replace in our atomic model, we need to understand it. Therefore, I guess we will take the leap! I apologize for not posting here since May, but personal misfortune has beset my family, preventing me from doing so. If I can concentrate enough, I will attempt to continue with this topic. In the previous post, I was explaining how the concepts of helicity and chirality, so important to the research of the LST's particle physics community, emerges from the world line charts of the LRC's RST research. Left or right helicity appears to be a relative property of S|T units which distinguishes the relative balance between the number of S and T units in the combo, and because it's subject to special relativity, is therefore not considered as an intrinsic property of the combo; that is, the relative balance of space and time motion in a combo appears to differ with the vectorial motion of the observer, at high speeds. The chirality of a particle, on the other hand, cannot change handedness with the observer's vectorial motion, since it is a property emerging from the inverse of the sector, which the observer inhabits. An easy way to remember the distinction between helicity and chirality is to refer to the chart of S|T and T|S fermion units, where both have a left and right set of combos relative to the neutrino. Recall that the similar chart of S|T and T|S boson units shows the same left and right pattern. According to Flip Tanedo of the Quantum Dairies blog, it is the property of chirality that has to do with the origin of mass, hence our interest in understanding how that might be. However, Tanedo's explanation involves the Higgs boson and the effort to define mass in a special way. As far as I know, there is no Higgs boson in the sets of S|T and T|S combos. Nevertheless, ultimately, the concept of the Higgs boson is necessary for the LST community in order to explain how the W and Z bosons can have mass. It's complicated, but Tanedo explains it with cartoons here. In the LRC model, on the other hand, the relative "mass" of the S|T and T|S bosons is straightforward: it is due to the imbalance in the combo's number of space and time units of motion, just as it is in the fermions. The trouble is, we can't explain yet how mass connects with this space/time displacement, and we also have to explain what the combos between the charged Ws and the neutral photons are. In the case of the S|T and T|S fermions they are quarks, but, in the case of the bosons, I don't know what they are, yet. Maybe, the idea of the LST community, which employs the so-called Higgs field, has led them down a rabbit hole that they need to come up out of, before they can move forward with a new idea, which employs combos of these as yet unidentified bosons. If so, we might be able to make an astounding contribution to the puzzle of particle mass in a simple, straightforward way. One thing for sure, though. We have no intention of following them down the rabbit hole of the proposed Higgs field and electroweak symmetry breaking to explain mass. If two up quarks and a down quark can combine in a proton combo and two down quarks and an up quark can combine in a neutron combo, then why can't similar combos form in the bosons? Maybe there is a reason they can't, but I think it would be worth investigating the possibility. I'm having a difficult time finding the right frame of mind to post, but I think I will try to post something meaningful before the end of the year. The most difficult aspect of the challenge that I face right now is how to explain why we need to take a fundamental turn at this point in the development, in order to explain mass. I don't know if we ever will be able to explain it adequately, but we know that it is three-dimensional, and the equations we've employed so far are one-dimensional, so it makes sense that we need to find the three-dimensional equivalent of our scalar motion equation for the S|T and T|S units, which have served us so well in calculating the one-dimensional properties of our scalar motion entities. As I've already mentioned, understanding the bosons is crucial to the progress of the LRC's RSt. We don't have virtual photons in our theory and we understand force as a quantity of acceleration, unlike the LST community, which regards force as an autonomous entity, incorporating such concepts as the "electroweak force," and the "strong force," to explain the particle physics of their standard model. Their concept of mass is tied to something called "electroweak symmetry breaking," which requires a boson called the Higgs boson, which we also don't have in our RST-based theory. The Higgs field is composed of Higgs bosons, and, according to the LST, particles with mass interact with this field of bosons, some more, some less, for some unspecified reason. However, the idea of symmetry breaking in the LST theory is part of the interesting idea of lepton-quark interaction, where an electron, for instance, can become a quark and vice-versa, when they are close enough together. In their view, such interconvertability implies the unification of the electron's electro-magnetic force and the quark's weak force into the electroweak force, only becoming separate forces, once they are far enough apart to break the unity, or symmetry. This is known as "spontaneous symmetry breaking," which the acclaimed discovery of the Higgs boson supposedly confirmed, but again, such a theory treats these forces as autonomous forces, and, as Larson pointed out, this is, in itself, a grave error. Force is simply a quantity of acceleration and acceleration is a changing quantity of motion, by definition. In an RST-based theory, everything is motion, stemming from the mother of all motion, the universal expansion, or the eternal progression of space and time. But, the LST doesn't recognize the universal progression, as such. They do recognize the universal progression of time, of course, and as of fairly recently, they discovered the universal progression of space, but, without understanding the key of reciprocity, that time is the reciprocal of space, they are lost, and so have postulated the so-called Big Bang theory of cosmology, where, to begin with, space and time explode outward from an infinitesimal point of infinite energy, cooling as it goes and causing the unified forces to spontaneously break out into four separate forces. To students of Larson's elegant RST, this thinking is simply repugnant for many reasons, and it gets much worse, as now the Higgs field, a sort of replacement for the universal ether, is thought to come in as many as five forms, each with its own boson. A quick overview of the original Higgs field concept is available here. As has been explained previously, in our RSt, the bosons consist of 3D space and time oscillations that are combined in a different configuration than that of the fermions. While the fermions consist of three S|T units schematically represented as a triangle, the boson consist of multiple S|T units schematically represented as a bundle of units in parallel. The difference in the physical configurations of the two types of combinations accounts for the difference in the observed properties of the two types of entities, but unlike the LST theory, these RSt bosons are not the quanta of force fields, especially a sourceless one, such as the Higgs! Thus, there are no gluon bosons, no graviton bosons and no Higgs bosons in the theory, but only photons that are bosons that are either balanced or unbalanced in their constituent quantities of space and time oscillations. S|T = 2/4 + 2/2 + 4/2 = 8|8 num, is a balanced boson, while 3/6 + 3/1 + 2/1 = 8|8 num, is not balanced, even though the magnitudes of their total num are equal. To avoid this difficulty, we use the short hand notation of xS|yT (yT|xS), indicating the number of S and T entities in a given unit. For the example given above, the balanced boson would be written as 2S|2T = 8|8 num, while the unbalanced boson would be written as 3S|T = 8|8 num. Nevertheless, the total num of a particle is important, since it seems reasonable to assume it determines the particles mass. Just how, though, is not yet apparent. The problem is that the electron and positron, with 18 num, are lighter than up and down quarks with 16 and 14 num, respectively, obviously there must be something else involved. The first thought that comes to mind is the dimensional differences between gravitational, magnetic and electrical forces. Electrical force is a 1d quantity, while magnetic force is 2d and gravitational force is 3d. Since the 1d electrical quantities of our S|T (T|S) units work out so perfectly, with leptons and quarks fitting together quite nicely and the beta decay processes also, it seems natural that the magnetic and gravitational quantities should too, if only we could take the model up a couple of notches to the 2d and 3d versions of our 1d equation. In a just and fair world, this would be a straightforward answer to the mass puzzle. It would explain why electrons and positrons have such little mass compared to protons and neutrons, but since the difference between 183 = 5832 and 463 = 97336 is not nearly enough, we must be missing something. In the next post, we will introduce a new direction in the mathematical approach of our RSt, which hopefully will lead us out of this impasse.